Meet GinGin, he is picture also with her sister Luna. GinGin is a sweet little boy. He is all orange tabby, eyes are between Green and Blue, depends on the light. He loves to be held and kissed, he is shy at first when we got him but is loving and kind . 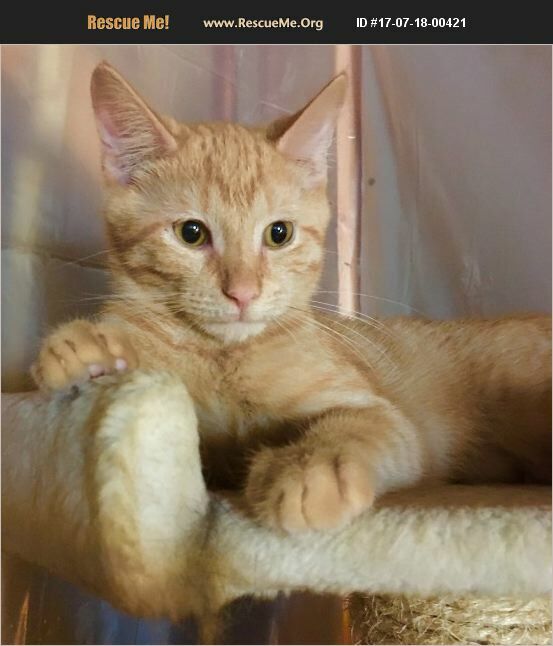 GinGin was neutered as of 7-31-17 and looking for his forever home. If you would like to adopt GinGin before he goes to PetSmart please call Jill at the number below and leave her a message about GinGin so she can call you right back. You can call Altered Feral State if you want more information on me, just ask for Jill (770) 876-0659, Please leave a message, your call is important to us. You can visit me 7 days a week at PetSmart in Bethlehem / Winder, Georgia. We are over in the cat section of the store, just look for me in my pretty hammock. We rotate our cats/kittens in and out of PetSmart to give them a break and allow them freedom to run around our shelter. If you are interested in a certain cat please call Jill before your visit to PetSmart and tell her which cat/kitten you are interested in so she can make sure the cat/kitten is there for you to visit. And of course all the nice people at PetSmart will be glad to help you adopt me here at the store. At Altered Feral State, we work with feral cat colonies. All of our kittens were removed from the colonies and completely socialized when they are less than 8 weeks old. We don't offer them for adoption until they have been tested, vaccinated and spayed or neutered. Our adoption fee of $100.00 & only covers a very small portion of our costs, but to us, it's all about finding the best home for these wonderful kitties. Please make an appointment with your personal Veterinarian for a well cat check up, your Veterinarian may recommend additional vaccines depending on the cats/kittens age. These costs are your responsibility.